If you are looking for an extensive selection of pavers in metropolitan NYC (Staten Island, Brooklyn and Manhattan), or in Central and Northern, NJ, Advanced Site Contractors is the place to call! We carry a large selection of brick pavers and concrete pavers that can be used in a vast array of landscaping and hardscaping projects. 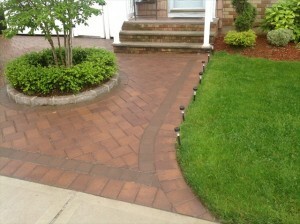 Brick pavers are an extremely popular option for properties in New York and New Jersey. These durable interlocking blocks come in an enormous variety of colors, sizes, shapes and finishes, transforming landscapes and exterior features into works of art. Concrete pavers are another popular option, due to their cost effectiveness, durability and ability to mimic the look of other more costly materials, such as slate or stone. We also use paving stones in some of our exterior design projects. Whether you are looking to create an eye-catching new driveway or a garden oasis, Advanced Site Contractors has over 25 years of experience in the business, with a focus on creating extraordinary outdoor areas utilizing pavers to enhance the beauty, functionality and value of properties. Our paver contractors are some of the best in the business and Advanced Site Contractors is one of the only fully licensed, bonded and insured exterior landscaping and hardscaping companies in the NYC metropolitan area that directly employs all of our own qualified contractors and designers. Exceptional concrete and brick paver work is one of the central features of many of the properties we design for both residential and commercial customers. Looking To Transform Your Property With Pavers? Contact Us! For more information about the extensive selection of pavers in Staten Island, Brooklyn, Manhattan, Northern NJ or Central NJ that we offer, or to discuss your exterior paver project with one of our expert paver designers and contractors, call us today at (718) 984-7483. If you prefer, you can contact us by filling out the form on the side of this page and we will get back to you.